I want to build a Virtual World in Unreal Engine, with the purpose of educating Fluid Dynamics. Still a lot of work has to be done. Followed several online courses on using blueprints in Unreal Engine. First video will follow soon? Update may 2017. I have reactivated the project. Was too busy with ordinary work :-). 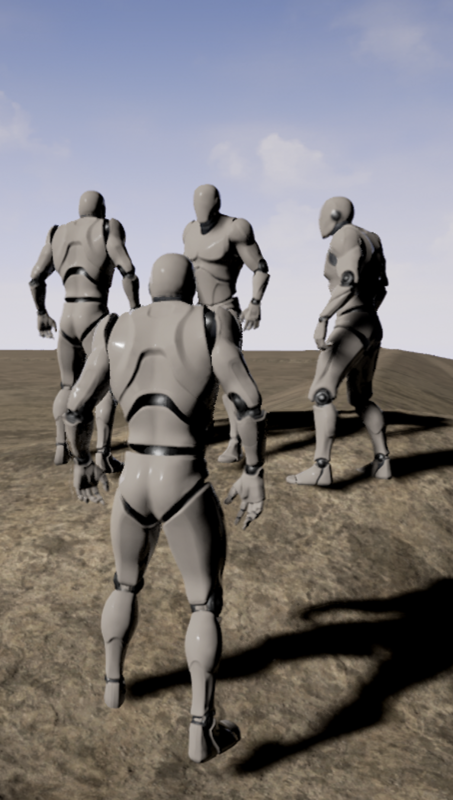 I am following a course on Udemy (Unreal Engine 4: How to Develop Your First Two Games) to get my skills on a higher level. I have bought the level tutorial from hourences. In this post the notes (things I want to remember) when watching the tutorials. Alt and mouse for staying looking at object. With BSP textures, select all faces and choose align in the proprieties box. Mesh, duplicate mesh, place on the proper location and replace by proper mesh. Ctrl Shift G is temporary ungroup to take out one part. Finish with Ctrl Shift G again. With landscape : change lod in details to increase performance. Disclaimer: I am new to Unreal Engine and just trying to get things working. So there is no guaranty it will work with your project. Maybe there are much better solutions. Don’t blame me if terrible things happen to your project. Always make backups. In the future hopefully more persons are going to work on the Unreal Fluid Dynamics project. So I decided to put my project on github. Yes, just as the Unreal Engine :-). I made an account and installed Github Desktop. Then things got messy, when uploading the project I got an error message by Github Desktop. I had no idea what was wrong. Also there was not a lot of info in the error message. So I started searching the internet and started to use the git-shell. This was the error message in git. 1. Github has a maximum file-size of 100 Mb. 2. Maximum size project on Github is around 1 Gb. My project has files > 100 Mb en the total size of the map is 4.8 Gb. So I was naive to think this could be working. Still I want to try to get the project on Github. – There are directories (for example saved and build) which can be deleted without a problem. 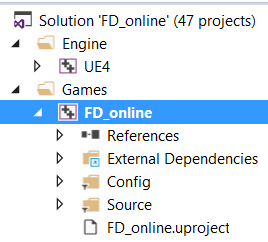 – There are directories (for example Content/Startercontent) which are big and added when the project is created in UE editor. So it is not necessary to put them in a repository. Looks like almost all data is stored in the .umap file (which is large). Very useful website on git commands. So I took the following steps. Enter your github info. Set the clone path to the directory with you project. It is the levelfiles (.umap) which get big. Your project is ready to get uploaded. Have patience, there is something happening / uploading. Check github.com if your files are really there. At this moment there is not a lot of content in my project, only a large terrain. The Directional Light simulates light that is being emitted from a source that is infinitely far away. This means that all shadows cast by this light will be parallel, making this the ideal choice for simulating sunlight. The Sky Light captures the distant parts of your level (everything further than SkyDistanceThreshold) and applies that to the scene as a light. That means the sky’s appearance and its lighting / reflections will match, even if your sky is coming from atmosphere, or layered clouds on top of a skybox, or distant mountains. gives an approximation of light scattering through a planetary atmosphere. This can give your outdoor levels a much more realistic look. Many maps have meshes out to the edge of the grid in the editor, but the actual playable area that needs high quality lighting is much smaller. Lightmass emits photons based on the size of the level, so those background meshes will greatly increase the number of photons that need to be emitted, and lighting build times will increase. The Lightmass Importance Volume controls the area that Lightmass emits photons in, allowing you to concentrate it only on the area that needs detailed indirect lighting. Areas outside the importance volume get only one bounce of indirect lighting at a lower quality. Settings I use in the UE editor. With my first project, when launching within the editor, I could not stop the game. My mouse stayed in the window. I had to close the window in windows. It It turned out you had to change a setting to activate the command-line. Setting the level my project has to start with. 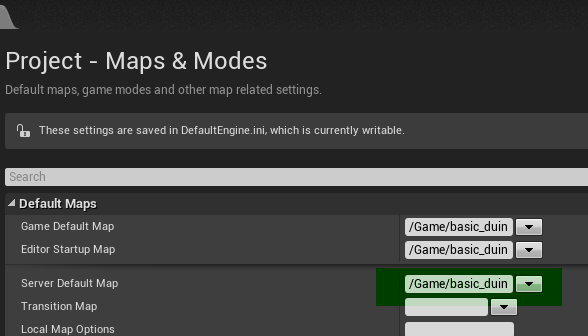 “Edit” , “Project settings” , “Maps & Modes”. Important, you also need to set the starting map for the dedicated server! It is hidden!! The steps I took to build a dedicated server. My goal is to get my project online and used as a multiplayer. I have windows 10 on a desktop. My goal is not to change C++ code in the unreal engine. Below the steps I took to build a dedicated server. 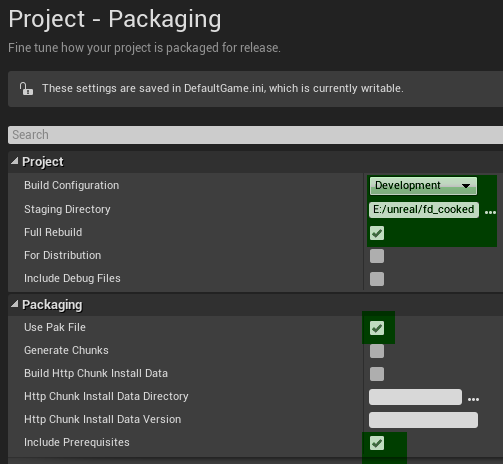 Important: install the correct components for UE4 development, check the “Game Development with C++” workload, and the “Unreal Engine Installer” optional component. As I understand, you really need to install this! Make Account at Github . Note: Don’t install the Github Desktop app. Make a connection between your Unreal account and Github account. Open your Unreal account on the unreal website , go to “account” , “personal”, “profile”. You will find a field for your GitHub account name. Note: Many tutorials show how to make a fork. Because I don’t want to change the C++ code, I did not make a fork at github. Note: I can’t remember when it is asked, but you should select the “release” branch of Unreal. If everything went well, EpicGames is added as an organization on your github account. You should be able to go to Epicgames on github. You don’t have to do anything on this page. Go to the map where the engine is unpacked . I copied the project to a dir/subdir/subdir….. To solve this I moved the projectmap to the root!!! Stupid problem, took me hours. Open VS 2017 by double click on UE4.sln. Note: The width of the “solution configuration”. box is small. You should see the following settings. Much to my surprise? compiling is done with 2015? Note : Besides the editor, you also have the launcher. I don’t believe the launcher is included in the C++ source. But because I have downloaded and installed the launcher on my computer, at some point it starts to appear when starting the UE editor. If you want you can just close it. Open your project in the UE editor. Some important settings are discussed in the following post. This will take some time, open “show output log” to see the action. Run you project outside of UE editor. Note: This step is not really necessary, but you are just going to look how your project looks. Go to your cooked map / WindowsNoEditor. Add C++ code to the project. At first I was not able to do the following steps. This because I could not find the C++ files of my project. It took me some time, but it turned out that I had to add these to my project!!grrr. Go to “file” in the UE editor. Select “New C++ class”. Don’t change any setting, just run the thing. 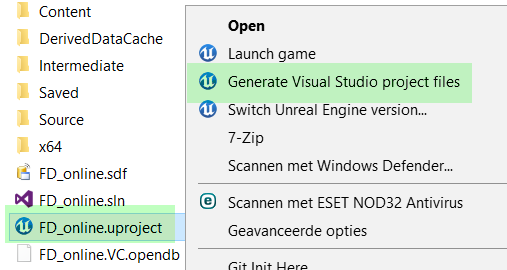 Preparation for compiling the server, generate VS 2015 file from the project. Go to the project map (not the cooked one). “Right mouse” click on the .uproject file, select generate VS files. 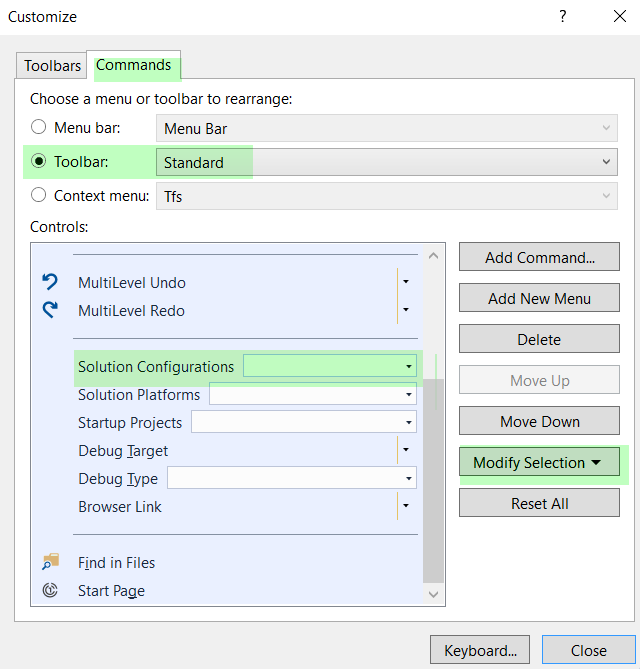 Build the project, with the “solution configuration” box set to Development editor. According to the tutorials, I should make an copy of “project”.Target.cs and rename it to “project”Server.Target.cs. 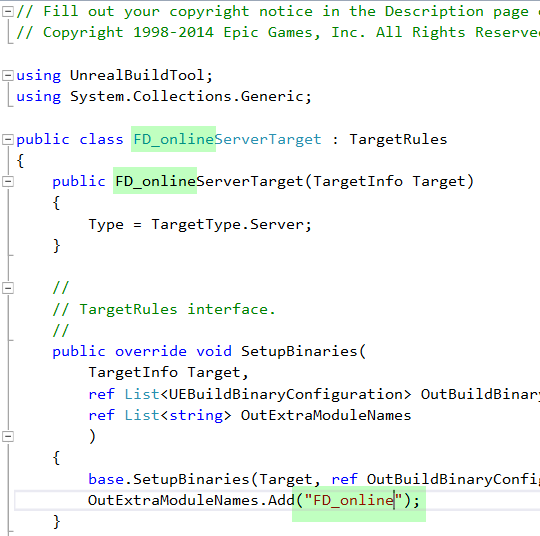 In VS 2015 I could not make this copy. So I did this with windows explorer. Go to the source map of your project. 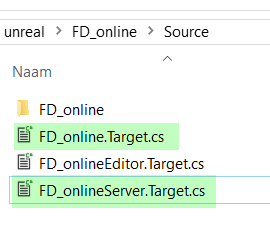 Copy and paste “project”.Target.cs and rename to “project”Server.Target.cs. 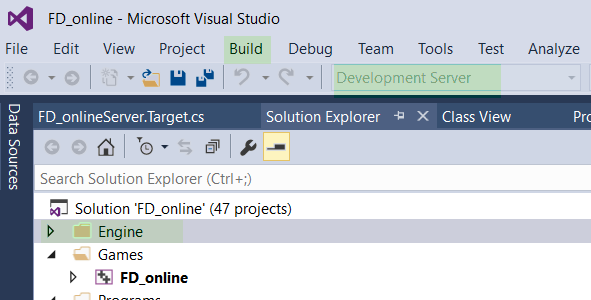 Double click on “project”Server.Target.cs , so the file is opened in VS 2015. Copy the template from link in the file. At 3 locations you have to replace game by the project name. In my case FD_online. Generate VS 2015 files again. Go to your project /binaries/Win64. Copy this file to your cooked version (see step 11) and paste the file in the /binaries/Win64 map. So the cooked map contains all files for both server and client. How to run server and client on your computer (test). Your are connected to the server.